The spine is composed of a column of vertebrae interposed by cushioning intervertebral discs. Each vertebra also abuts the vertebra above and the one below via the facet joints (one on each side). The facet joints are true joints just like the knee or the shoulder. This means that they are lined with cartilage, contain joint fluid and are encased by a fibrous capsule. Just like any other joint in the body, the facet joints are susceptible to arthritis. Arthritis of the facet joints can lead to neck or low back pain. 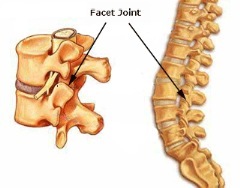 Signs and symptoms of facet joint arthritis often mimic those of a herniated disc. If the cervical spine is involved, neck pain radiating into the shoulder or arm may be observed. In the lumbar spine, low back pain which radiates into the buttock and/or leg is commonly observed. Injection of an anesthetic combined with a corticosteroid medication into the facet joint itself is both diagnostic and therapeutic. In other words, relief of neck or low back pain symptoms following a facet joint injection confirms the diagnosis and also treats the condition. 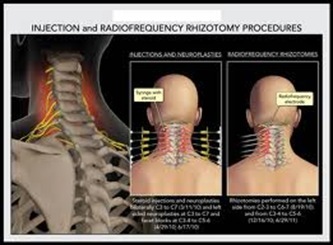 In cases of persistent facet joint syndrome, a radiofrequency rhizotomy may be considered. 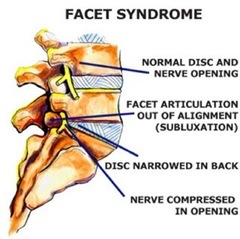 This is where the nerves that supply the facet joint are heated with radiofrequency current thus blocking the transmission of pain signals to the brain. Pain relief can last anywhere from six months to two years. Contact Dr. Matthew Grimm, best pain doctor in New York City, to schedule an appointment today.